Architects are all dreamers. While their special projects and grand ideas often aren’t considered practical enough to be created, looking at their concepts is a great way to see the potential that architecture holds in the future, as creativity and beauty is increasingly rewarded. The top left skyscraper is a dream of architects Adrian Smith and Gordon Gill, planned to be created in Dubai. 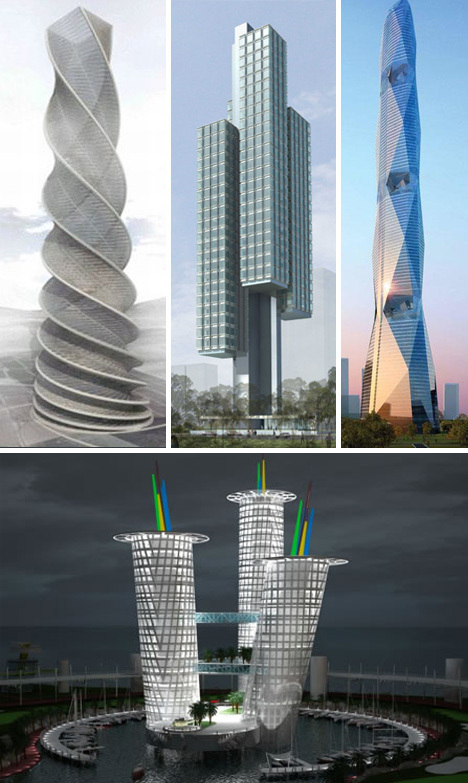 The architecture firm TVS Associates came up with an even crazier concept for four towers, also planned for Dubai. Guess where that last building is being planned for? Yep, Dubai! 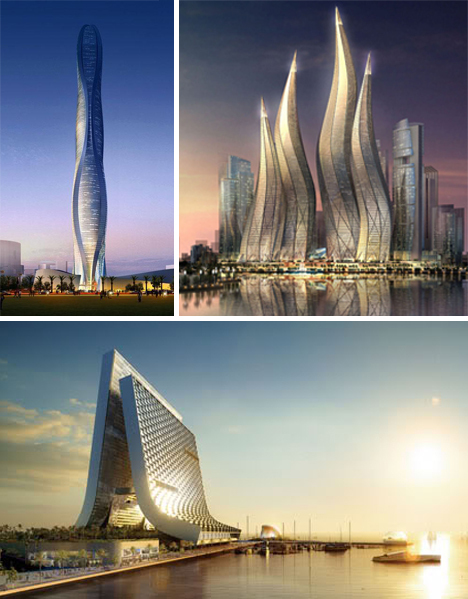 Oppenheim came up with this gorgeously flowing Marina and Beach Tower. Designer Michael Jantzen loves to design towers with a fun, open aesthetic and a functional purpose (in this case, generating wind power while providing a beautiful view). 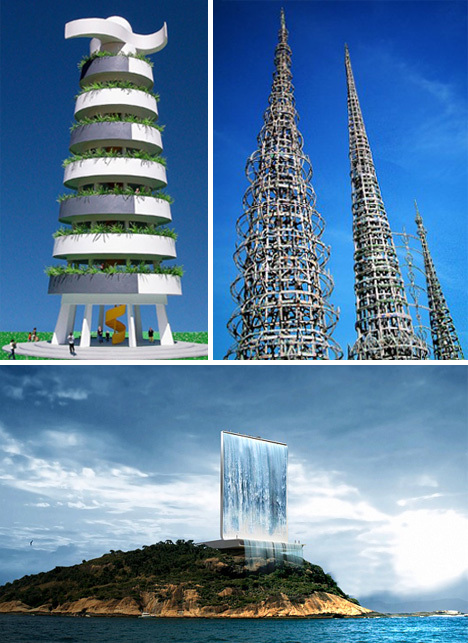 The Watts towers are a famous one man project built in an abandoned lot by Sam Rodia, showing that some of these concepts can be built, even if it’s on a small scale. The final image is the back of a solar tower being built for the 2016 Olympic games being put on in Rio. The back has a gorgeous waterfall, and the front, featured below is equally stunning. The Atrium City Towers, created by Adrian Smith, are a concept design for a series of connected towers to be constructed in Dubai. The front of Rio’s 2016 Olympic Games torch is a gorgeous structure, which will get a lot of use even after the games. 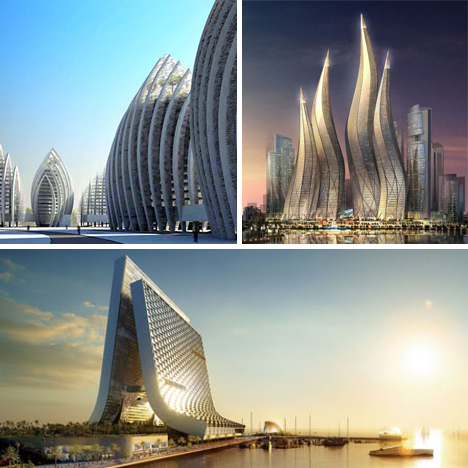 These waterfront structures are planned for a Malaysian waterfront, and were designed by Studio Nicoletti Associati. Created for an Olympics, the “falling towers” building in Beijing, China (concept shown) are now a reality in the city. The Almaty Twin Towers are going to be built in Kazakhstan. They were designed by Norman Foster. 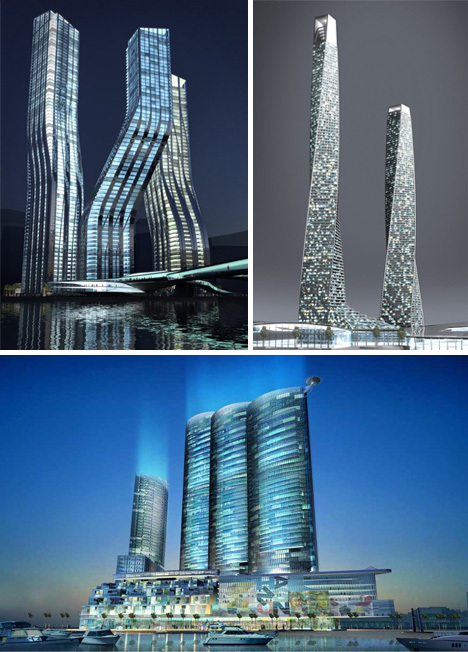 Zaha Hadid designed the “dancing towers” which reject the typical idea that towers have to be perfectly vertical. 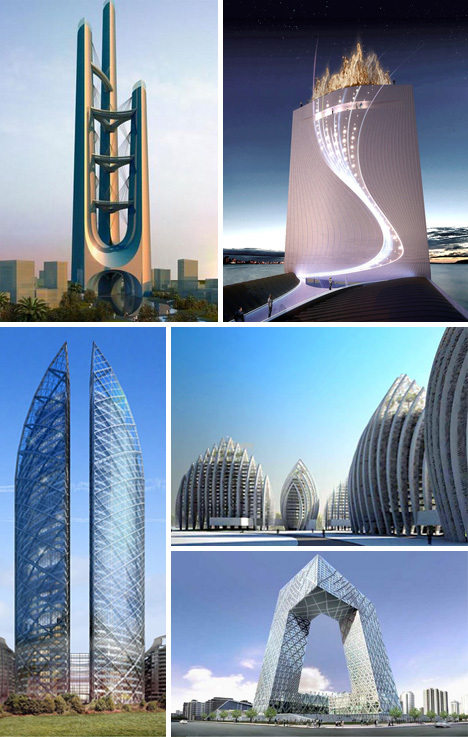 The Dubai Towers (now a canceled project) were also more fluid than most, adding a literal twist to the typical tower. The Nomas towers in Bahrain are an interesting concept and almost look like smoke stacks more than mixed use buildlings. The Fog Tower was designed by Alberto Fernandez and Susana Ortega and would stand at the edge of the Atamaca desert, absorbing moisture and creating a beautiful haze. the Singapore Towers are a wild twist on the typical tower, with several sections hanging off of a central core, and creating an incredibly unique look. This 101 story tower was designed for Dubai (where else?) and while it would stand out remarkably in most other cities, it says something about Dubai’s architecture that this one seems almost mundane. 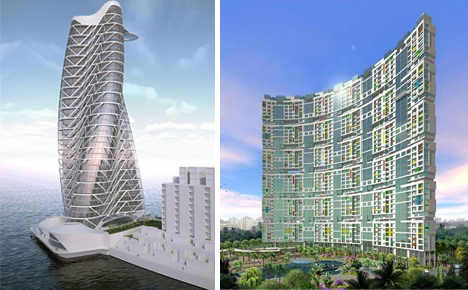 The Z10 Towers, designed by Dinesh Doshi, are mixed use and remarkable for their appearance, and the fact that they are surrounded by water. The Moda-Gakuen Spiral Towers were designed for Nagoya City, Japan and have a stunning fluidity that is perfect for a structure on the edge of the water. Mumbai has this interesting design, an over 50 story building developed by Godrej Construction that is somewhat reminiscent of building blocks.